A morning walking on the moor and an afternoon of fun team activities at the Orienteering field. 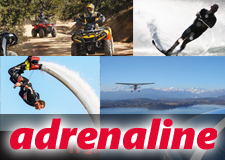 Package includes assistance from certified instructors, equipment hire, lunch. 10 possible routes to choose from to experience a day between Lake Maggiore and the Ticino. The package includes assistance from certified instructors and equipment hire. 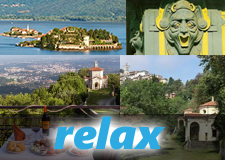 Immersed in the greenery of the Varese countryside, with a choice of 7 routes. 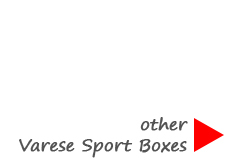 Package includes: assistance from national Mountain Bike guides, bike and helmet hire. A chance to admire Isola Madre and Isola Bella from up close, with spectacular views of the botanical gardens on both islands. The small and characteristic Isola dei Pescatori is located further north and is the only one of these three islands to be inhabited. On the way back you’ll see Eremo di Santa Caterina, a fascinating monastery nestled on a sheer drop over the lake. A perfect outing for the family, a boat excursion to the monastery nestled on a sheer drop over the water, in a space which appears suspended in the air. In the afternoon an art guide shall accompany adults and children on a journey of discovery of architecture and important works of art inside the monastery. Horse riding lesson morning and afternoon (western riding, walk around the the stables to get to know horses on the farm in their box and find out details on their characteristics and habits). Hack to the woods, English or Western style riding. Lunch at the Club House with menu featuring typical km 0 products. Goodbye aperitif. 10 possible Nordic Walking and Nordic Trail routes for an alternative day experience between Lake Maggiore and the Ticino. Price includes assistance from certified instructors, equipment hire and overnight stay. 7 possible mountain bike excursions to discover the greenery of the Varese Province. 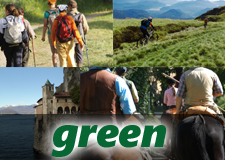 Price includes: assistance from national Mountain Bike guides, equipment hire and overnight stay. Accompanied by a tourist guide, morning of soft trekking to discover the military constructions along the Cadorna Line dating back to the First World War. Price includes stay in hotel, dinner at a restaurant on Lake Maggiore, lunch at a typical restaurant or agritourism, assistance from certified instructors, entry to the Cadorna Line Museum. Two days in nature, including horse riding lessons (according to level of guests) and hacks in the woods around Lake Maggiore. Price includes dinner of typical local products, over night stay at hotel with breakfast and lunch at club house, featuring km0 products. Two days in contact with animals, nature, aromas. The horse: from brood mare to foal – a visit to the stables for an overview of the rhythms and essential steps in a horse’s life, from birth to reproduction. Live stock: needs and requirements. Wool: from production to manufacture. Horse riding lesson according to level of guests. Price includes lunch, dinner and overnight stay at hotel. An opportunity to experience a series of sports activities at a non-competitive level (nordic walking, trekking, mountain bike). Price includes all equipment hire, assistance form certified guides, stays in hotels, lunches, dinners, transfers as per programme. A programme for those of you who wish to escape hectic city life and experience nature’s genuine emotions, an opportunity to interact safely with horses and enter their world, even if it is your first time. Three days accompanied by a personal tutor, lessons and horse back excursions along paths among the wonderful landscapes of the lake area. Price includes accommodation and food.